Press Association and Sarah Stack. President Michael D Higgins has called for the urgent need for public housing to address the problem of homelessness. The President was speaking today after the publication of a Simon Community report, which says 1,400 people a night are seeking emergency shelter in Dublin. “We need public housing and we need public rental housing of the highest quality,” President Higgins said. “And we need to be able to provide it in a way that enables families who are in that housing to go on and fully participate in society. “I have in fact spoken about it quite so frequently recently because I’m not happy with, if it were, the retreat from management of public housing estates by the administrations of many of the local authorities. The Simon Community has said government vows to end long-term homelessness by 2016 will fail as 1,400 people a night are homeless. The Simon Community in the capital said the crisis is spiralling out of control as the use of hostels, hotels and B&Bs to house people is becoming the long-term solution. Chief executive Sam McGuinness said every day the most vulnerable are being hit with a complex mix of housing shortages, soaring rents, inadequate allowances and discrimination against people on welfare. "Recent talks about green shoots are not reaching the most vulnerable in our society, the majority of whom never experienced any benefits from the Celtic Tiger. Sadly, the less fortunate have become have become more unfortunate," he said. Mr McGuinness described the crisis as a fast-moving tide of homelessness. Dublin Simon is the latest in a line of charities including Merchants Quay Ireland and The Peter McVerry Trust which work with rough sleepers, drug users and the homeless to warn of the extent of the problem despite promises to end homelessness by 2016 only made last year. Meanwhile, Mr McGuinness warned that temporary accommodation was now becoming a long-term solution with at least 50% of people who are seeking a permanent home now stuck in emergency shelters for more than six months. On rough sleeping in Dublin city, Dublin Simon said a volunteer group counted 158 people on the streets on one night last week, 24% more than the official count last April. 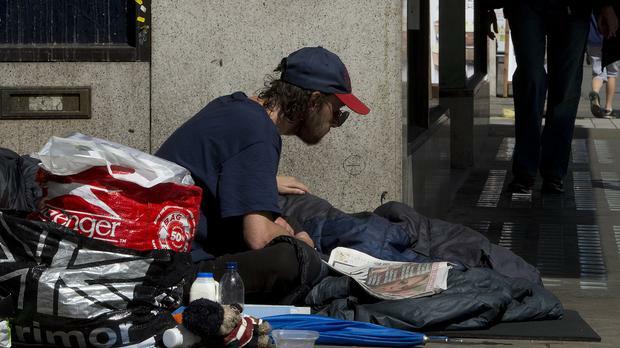 The charity said that figure should be seen as the absolute low, as it does not include people classed as hidden homeless who are sleeping on sofas, staying in squats, in hospitals, hanging out in 24-hour internet cafes or paying for B&Bs. Mr McGuinness warned that a target set this year for 1,100 tenancies in Dublin has been slashed by one third. "It is blaringly obvious that thousands of vulnerable and frightened people are being trapped in the revolving door of inadequate and insufficient emergency accommodation, forced to remain roofless," he said. "The longer people are forced to remain in emergency accommodation, the more intense supports they will need when they are lucky to have the opportunity to move on." Dublin Simon said its volunteers are also seeing a significant increase in the number of people bedded down in doorways, lanes and shop fronts in the inner city from Jervis Street to Amien Street and Harcourt Street. It said demand for sleeping bags increased by 57% in the year to the end of June. Dublin Simon increased its housing capacity by 54% in Dublin, Wicklow, Kildare and Meath in 2013 to meet demand for accommodation. Overall last year the charity provided services to more than 3,000 people and its rough sleeper team made 4,241 outreach contacts. It also supported drug users with 3,284 emergency needle exchanges, a 31% increase on figures for 2012, and recorded a 20% increase in the number of people accessing our treatment services including residential detox, recovery and aftercare services, newly opened HIV respite/ stabilisation service and counselling. Elsewhere, the charity's visiting tenancy support services, which provide prevention support for people who are at risk of loosing their homes, successfully helped 70% of people stay in the home.